If you've ever dreamed of the perfect Greek Island vacation, you've probably already lost your heart to Santorini. Its gleaming white Cycladic houses and windmills frost the tops of nearly 1,000-foot, multi-colored cliffs like icing on a wedding cake. Both rugged and romantic, it's a fount of legends and a ravishingly beautiful destination. After you've admired its beauty, favorite things to do include cruising, seeing ancient sites, and kicking back to enjoy the beaches, Greek cuisine, and a world-class sunset. The island of Santorini stretches out like arms, its cliffs wrapped around a giant, nearly circular bay. This is the caldera—the legacy of the collapse of the historic volcano that tore away a huge chunk of the island in about 1600 BC, 3600 years ago. It is called the Minoan eruption because the impact of it probably wiped out the Minoan civilization on Crete. And scientists think it was the largest volcanic eruption of its type for the last 10,000 years. The best way to see the cliffs—which are strikingly gorgeous—is from within this caldera, which has been flooded for thousands of years. Nothing beats arriving by ferry to the ports, backed by the towering natural walls of stone. But don't worry if you haven't the time for a seven to 12-hour ferry trip from Piraeus and have to fly from Athens to Thira (the official Greek name for Santorini) instead. There are dozens of day and evening cruises in the caldera that you can book from local travel companies on the island; better yet, book and pay before you even arrive. Options range from short sightseeing cruises and trips to islands in the caldera to day cruises with buffet lunches and romantic sunset dinner cruises. The price will depend on whether you choose a motor launch, a sailboat, a catamaran or a kayak cruise but, in general, trips run between $50 and $200. Check the tour company Viator to book and pay for your cruise before you arrive. Santorini Cruises have daily sunset cruises on their exact replica of a 19th-century Brigantine. And Sunset Oia offers day and sunset catamaran cruises. Your hotel will probably be able to recommend cruise companies and local captains as well. But if you are planning to visit during the busy summer and early autumn months when Santorini is packed with visitors, it's better to book your cruise before you arrive. Nobody can really prove that the civilization that existed on Thira (ancient Santorini), contemporary with the Minoans on Crete, was the lost city of Atlantis. For one thing, none of the Greek writers ever wrote about Atlantis except Plato, and his writings suggest a date for its destruction of 9,000 years ago—about 6,000 years before the giant eruption that wiped away half the island. In 1967, archeologists began excavating a site on the southwestern tip of the island. Now considered one of the most important archaeological sites in the Aegean, the 50-acre site has evidence of occupation by a sophisticated civilization between 4,000 BC (Late Neolithic) and 3,000 BC (Early Bronze Age). The town had large multi-story houses, paved streets, water supplies, and sewage systems, and, within the houses, evidence of trade with Minoan Crete, mainland Greece, Syria, and Egypt. You can visit the site and imagine what life must have been like before earthquakes caused the people of Akrotiri to flee and a volcanic explosion buried their city. It's undercover and is open to the public between 8 a.m. and 8 p.m. daily during the summer and 8 a.m. to 3 p.m. Tuesday to Sunday during the winter. Standard admission is 12€. Open days and the dates of the summer and winter seasons vary from year to year, so check their website. Santorini's beaches line up along its east and south coasts. Most have dramatic, black volcanic sand but a few, like Kokkini Ammos Cove, near the excavations at Akrotiri, have brilliant scarlet sands too. Kokkini Ammos, usually called Red Beach, for obvious reasons, is narrow and very crowded but get into the water, off the beach and there are pockets of hot springs. Perivolos, a long, wide black sand beach, has bars, music, and a young crowd, while Perissa and Exo Gialos, with similar black sand beaches, are much quieter. Consider wearing bathing shoes at Perissa—it has a slippery reef to cross before you reach good swimming waters. Visitors who like nicely swept, well-kept beaches with umbrellas, chaises lounges, bars, changing facilities, and restrooms should head for Kamari. And for sheer strangeness, the wind-shaped, volcanic tufa formations at Vlychada beach are a must visit see. Fancy the idea of swimming in volcanic waters? Take a boat excursion from Oia or Fira to one of the two volcanic islands to sample very hot springs. Agios Nikolaos, an inlet on Nea Kameni (Greek for "new hot island") has hot, yellow, sulfurous waters that are supposed to be good for your health. Palea Kameni ("old hot island") has a hot spring that turns the water from turquoise blue to deep red. The volcanic activity on and around Santorini is not something from the ancient past. The island is a dormant, but still active, volcano. Nea Kameni and Palea Kameni, the two islands in the Caldera, are actually lava flows from occasional eruptions. In the past 2,000 years, it has erupted at least nine times—three times in the 20th century alone. The last major eruption, on Nea Kameni, occurred in 1950. Tour boats visit the uninhabited Nea Kameni from the old port of Fira regularly. Visitors on these day excursions hike inland and uphill for about 20 to 30 minutes, through a desolate landscape dotted with strange formations. The path to the top takes you all around the crater. It smokes and reeks of sulfur. And, in case you doubt that this is still an active landscape, most guides dig a shallow hole so you can feel the island's heat. Tours to the volcanic island take about two hours. The Greeks brought wine to the rest of the Mediterranean, and Santorini can boast some of the oldest—if not the oldest—vineyards in the world. Archaeologists have found evidence of winemaking going back at least 3700 years. After the massive volcanic eruption of 1613 BC, Phoenicians colonized the island and brought their own plants. Only the woody grape vines survived the barren soil and harsh conditions. Today, one of their vineyards, planted in 1200 BC, is still producing wine grapes and has been in continuous cultivation for 3,200 years. Most vineyards still prune their vines close to the ground, using an ancient method unique to the island. The vines are woven into baskets with the fruit protected from wind and sand within them. Art Space is an art gallery and museum within the pumice caves of an old winery. The owner has created a small winery in one of the original, underground caves, where traditional dry white wines and vinsanto, the local sweet dessert wine are made. Boutari Winery near the traditional village of Megalochori is interesting. This was the first Santorini winery to open its doors to the public. Its west facing location means that you can enjoy a wine tasting while watching the famous Santorini sunset. Gaia Wines sits on the beach between Kamari Beach and Monolithos, a family-friendly beach. Like most Greek islands, Santorini has several local specialties that are worth tasting when you visit. Capers are gathered wild from the steep walls of the Caldera and the stone walls between vineyards. Before being pickled in brine—as most capers are—they are sun-dried to a pale blond color. These sun-dried and rehydrated capers, along with sun-dried tomatoes give the typical Greek salad a unique, Santorini spin. They also turn up in most island soups, stews, and sauces. Fava is another island specialty. The yellow dried peas grown on the island are pureed so that they resemble smooth hummus, then served as a dip with lemon juice, olive oil, and chopped onions. Tomatokeftedes, or ntomatokefthedes, as they are sometimes spelled, are the island's poor man's "meatballs." Thick-skinned, fleshy tomatoes are grated or finely chopped, mixed with herbs, spices, and flour, rolled into small balls and deep fried. Vinsanto is a very sweet dessert wine made from raisins dried on the vine. In Fira, people gather on the short promenade along the cliffs near the Cathedral at sunset. You might need a reservation, but it's a treat to relax with a drink or bite to eat at one of the many cliff-clinging bars and restaurants. It may get crowded but the town at the northern tip of the crescent of Santorini is Oia which is the best sunset viewing location on the island. Sunset lovers should walk to the lighthouse at the extreme southwest part of the island of Santorini at sunset. Mnemossyne Gallery in Oia is a favorite with visitors. It's located in a lovely cave house just a few steps before the Castle and the well-known sunset spot. There are art photographs of local scenery, hand-made jewelry, sculptures, and pottery—all by excellent artists. Art of the Loom Gallery in Caldera is another favorite. The Cycladic-style building housing the gallery was built in 1866 and was originally used as a winery. serving the needs of the local society for wine production. You'll find works by many well-known Greek artists including oil paintings, jewelry, ceramics, and art glass by the co-owner of the gallery. They have galleries in three scenic locations. In Kamari, visit the Eduart Gjopalaj Workshop on the seaside boulevard and in Fira town next to the Catholic church. The artist is known for his carving and sculpture in wood. He also does art glass. Visitors will enjoy interacting with the artist and learning about his self-taught craft. The Fira to Oia hiking trail will take you along the rim of the caldera where you will marvel at the breathtaking views. You can hike it either way, but this way is reportedly less steep. It's a 12-kilometer hike one way (take the bus back) taking about 2.5 hours. Day hikers or boots are recommended for the more rugged parts of the trail The views of the volcanic landscape are impressive. You can do it on your own, but there are tours that take this route. Shopping for folk art and souvenirs is a great part of exploring the villages of Santorini. Oia is a place you'll find some very high-end shopping for jewelry and casual resort fashions at high prices. There are some tempting ceramics and artwork, too. Fira is where locals shop for themselves and the prices are reasonable. You'll also find boutiques and souvenir shops selling souvenirs, natural sponges, and handicrafts on the narrow intriguing streets in the northern part of the town. Take a sunset Catamaran cruise with Spiridakos Sailing Cruises. Sailings can be private or semi-private. Enjoy the deep blue waters of the Aegean Sea at sunset while being served by the onboard crew. A five-hour sunset cruise sails from the southern port of Vlychada. Pick-up from your hotel is available; reservations are necessary. Fish with the fishermen in the volcanic caldera of Santorini and around the islands. Instruction, licenses, rods and reels, and bait are provided for the day. Keep your catch and time permitting, they'll even cook it onboard for you. If the boat is due to return to port, you can take the fish to a local tavern/restaurant by the port and they will cook your fish for you at a reasonable cost. You can even visit the hot springs and go snorkeling while motoring around the area. Snacks and beverages are available and there is a restroom onboard. 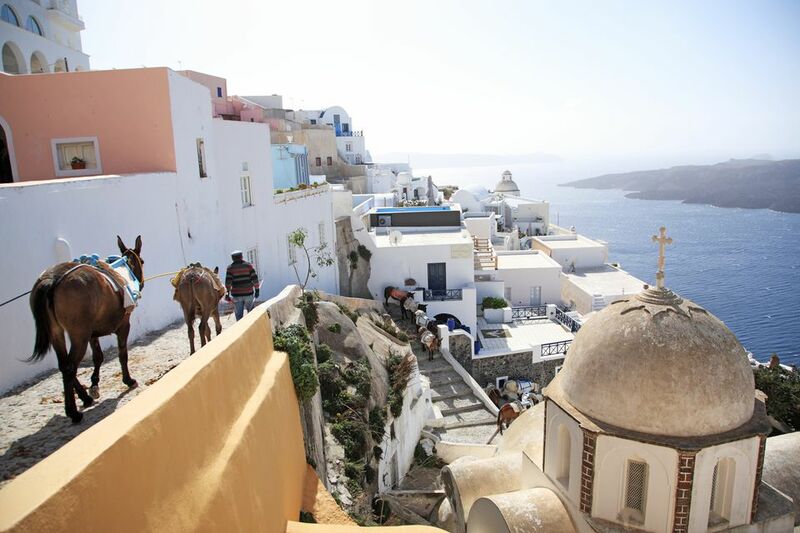 The traditional donkey ride on Santorini is something that has been done for 100 years. Ride a donkey or mule from the port at Fira, the Santorini Donkey Terminal, Ammoudi Oia. You can also take a donkey ride on the Fira to Oia hiking route. Ride for as little as 20 euros one-way from the port. Thirassia is on the western side of the caldera and before the volcanic eruption, it was actually connected to Santorini. It's a small village with some good cafes and tavernas. Boats leave several times a day from Ammoudi and the Old Fira port and run until about 5 p.m. The cost is only a euro for each way.